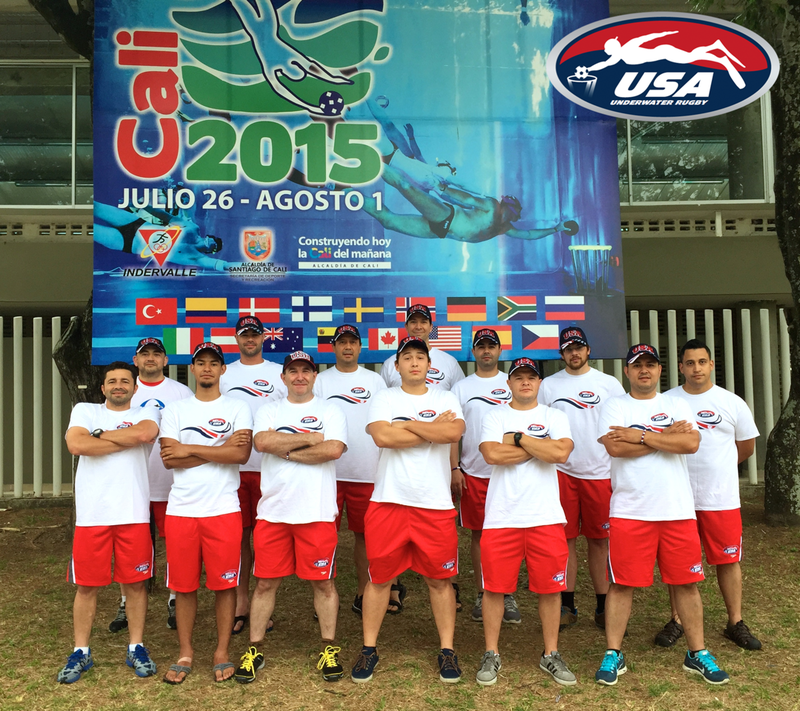 New York City — The United States men’s and women’s teams have surpassed all expectations at the 10th CMAS Underwater Rugby (UWR) World Championships that ended on August 1, 2015 in Cali, Colombia. Matched against strong opponents, the US teams were able to showcase the sharp rise of the sport in North America, not only in terms of the number of players and clubs but also the quality of the game. This report focuses on the men’s experiences and a report on the women’s team will follow soon. Since US head coach Jose Luis Echeverry organized the first national tryouts in January 2015 for the Underwater Society of America (USOA), the team has developed into a strong band of players. 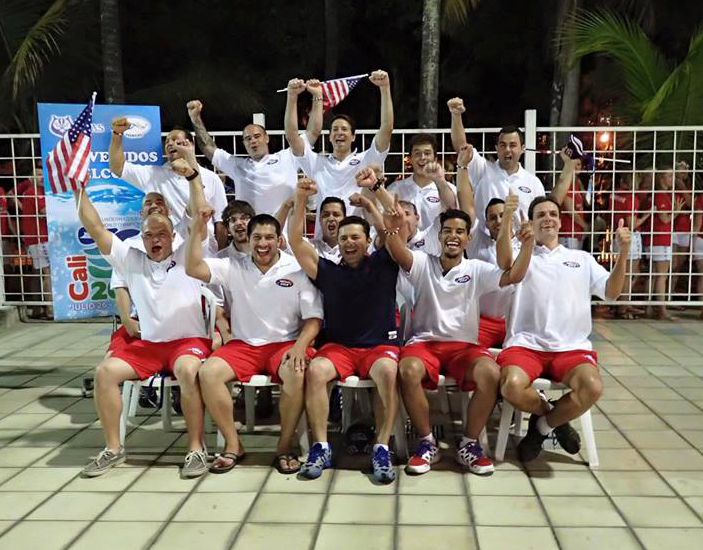 “We had 42 candidates at the try-outs”, recollects Echeverry, ”and I knew that we’d get a good team together.” Since then, the US team organized five additional clinics to work on their coordination and strategic moves. The World Championships presented themselves as a continuous improvement of the team’s strength. Due to a random draw in the group phase, the US men first faced two very experienced and strong opponents: Austria and Sweden, the majority of whose players also play in the elite European Underwater Rugby League (EUWR). Given the structure of the championship the first game of the competition against the Austrian team was the tournament’s single most important match. Head coach Echeverry reminded the team to stick to the rotation system, to provide assistance and to trust in the strong fore-checking skills. But the US players were unable to get into their game and a strong Austrian team was able to score early in the game. To win the game, the US team had to play more offensively and hold the ball close to the Austrian goal. However, this tactic made the team vulnerable for counterstrikes and despite some strong attacks, the experienced Austrian players were able to exploit avoidable mistakes by the US team. When the Austrian goalie pushed away American attacker Mike Picot who had stolen the goal just before the American received a pass that would have led to the deserved first goal of the team, the referees called a penalty shot against Austria. US defender Daniel Naujoks executed the penalty fast, getting quickly under the Austrian goalie and though the keeper brushed Naujoks’ mask away it took only 15 seconds before the ball was sunk decisively in the net. When the match finished after 30 minutes, the score card counted 10:1 for Austria. In an interview about the first US goal in this competition, Naujoks highlighted that the team sold itself short. “We can play much better — maybe because it was the first game of the competition but for some reason, today wasn’t our day”, he said. The US team had come to Cali to show that they can exert pressure and score clean goals to win matches. It took only 48 hours before this prediction was proven right. The next day, the US men were confronted with the Swedish team that had previously won against Austria with 9:0. US Coach Echeverry had made several adjustments to the team to avoid getting a goal through a fast break by the quick Swedes and to strengthen the team’s defense. The US men played strong and were able to control the ball for long stretches of the game, avoiding the aggressive fore-checking by their opponent. As only the first two teams of each group advanced to the play for the top 8 ranks, the US men joined the group playing for places 9-12. “With different opponents in the group phase, we would have played in the best-8 group”, said head coach Echeverry, “but there’s always an element of luck in competitions. That’s just part of the game.” But the US team was eager to show that each match mattered, starting with the first team they faced in the final round: South Africa. The South African team had already played the 2011 World Championships in Finland with strongly spirited players who were eager to represent African rugby. On the fourth day of the World Championships, Team USA faced Australia. The Australian men were well conditioned and physically strong. Many of them had come to Colombia a month ahead of the championship to train with the best Colombian teams. Australia had played well against Spain the previous day, almost defeating the Spanish players. In the match against Australia, the US men presented an organized game, controlling the ball, defending strongly, and going aggressively after the ball. But this sport teaches us that a brief slip in a team’s attention can be punished. Thus, in the middle of the first half, Australian forward Justin Bees managed to break-away with the ball from mid-field and lay the ball in the open net just before the US keeper reached the goal. Thus, Bees, who lives in Colorado and regularly plays with US teams, put Australia with 1:0 in the lead. Men’s team USA celebrate after hearing the National Anthem for the second time. Shortly afterwards, the US offense went in strong. US goalie Giancarlo Castro brought the ball in from the safe corner, keeper and coach Jose Echeverry made the first attempt to score and passed to Daniel Lopez who equalized the score to 1:1. US Capitan Giancarlo Castro recalls, “that was an important goal, but we wanted to score more, and we knew we could.” In the second half of the match, the US team dominated and had several chances to score without converting them. It was then that Daniel Naujoks was able to shove the ball from above the goal passing the Australian keeper’s head, leading to the winning score of 2:1. Thus, after the fourth match of the United States Underwater Rugby team, the players joined in as the US anthem sounded over the competition pool for the second time. Spain join team USA after the final match for the 9th place. But the Spanish would not grant an easy victory. In an evenly matched game, both teams played strong rugby and made no mistakes. After an intense press play by the US players around the Spanish basket it was forward Mateo Galeano to score the winning goal. While the US team had a few additional chances to strike again and also the Spanish team came once close to the American net, the match ended with a deserved 1:0 victory for the US men. The third time in a row, the US players lined up arm in arm to the tune of the Star-Spangled Banner. Deviating from the normal protocol, and in a display of mutual respect for a good last game for the 9th place of this World Championship the Spanish players joined the US team on their side of the pool for the US national anthem. Rüdiger Hüls, president of World Underwater Federation CMAS’ UWR Commission that organized the World Championships, praised the strong US participation and the team’s quality play. Several team captains and coaches expressed that they look forward to competing against Team USA. Overall, the American rugby players were considered a strong international team that has the technique and strength to play at the highest level. Many players voiced that they were looking forward to playing US teams at the annual Champions Cup and several teams suggested that the US team would be predestined to organize a high-level competition, such as open Pan-American championships. But the players were certain that the team would come back much stronger for the next world championships in 2019 that will be organized in Italy. “We’ll be even faster, stronger, and more organized by then — you just wait and see”, said coach Echeverry. “But for now, it’s time to celebrate today’s success. We can be proud of what we achieved here in Cali”, he added and smiled.